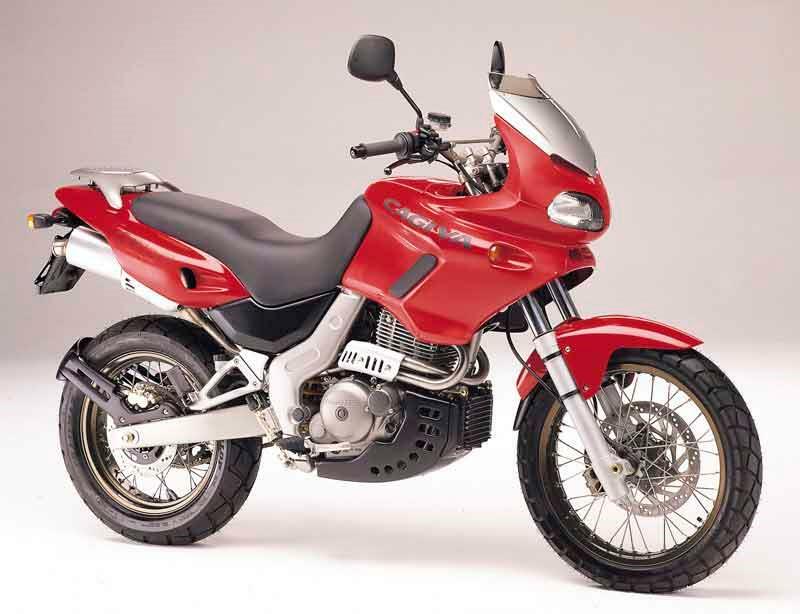 There are no end of single cylinder commuter/trailie bikes around if you have the urge, so the Cagiva Canyon loses out for a couple of good reasons in that hard-fought battle for novice biker cash; first off, it's not the most reliable, even by Italian standards. Secondly, it just doesn't have the oomph to match its city slicker looks. What's more, the Rotax engine is outdated and down on power. 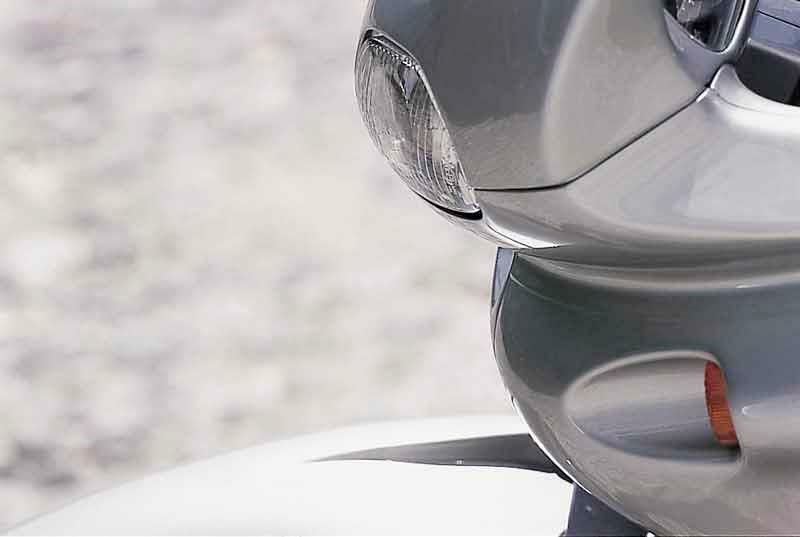 The Cagiva Canyon is nice and soft for novice riders, but once you gain some confidence and riding skills, you'll soon wish the Cagiva had more precision, more panache, than it can offer. 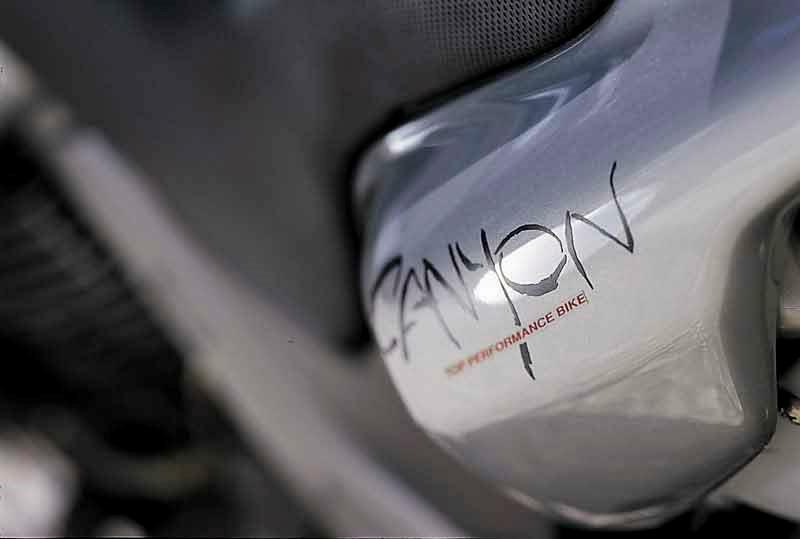 Non adjustable front forks and a squishy rear monoshock make the Canyon something akin to a mobile bouncy castle on a country lane. 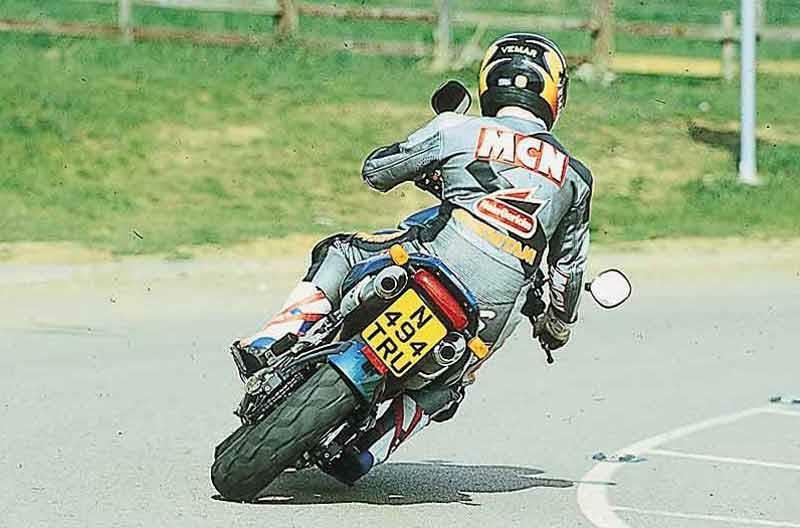 Here's an odd thing, with the Canyon, Cagiva started out with a 600cc single, then downsized to a 500. Not exactly progress some might say, although to be fair the old 600 Rotax lump makes about the same poke as the later 500cc unit. But both feel very vibey and are unpleasant above 65mph. The Cagiva Canyon is just not very well made basically, with the chances of electrical gremlins, bits coming loose or engines spluttering to a halt all realistic scenarios. Starter motors are known to fail on them. 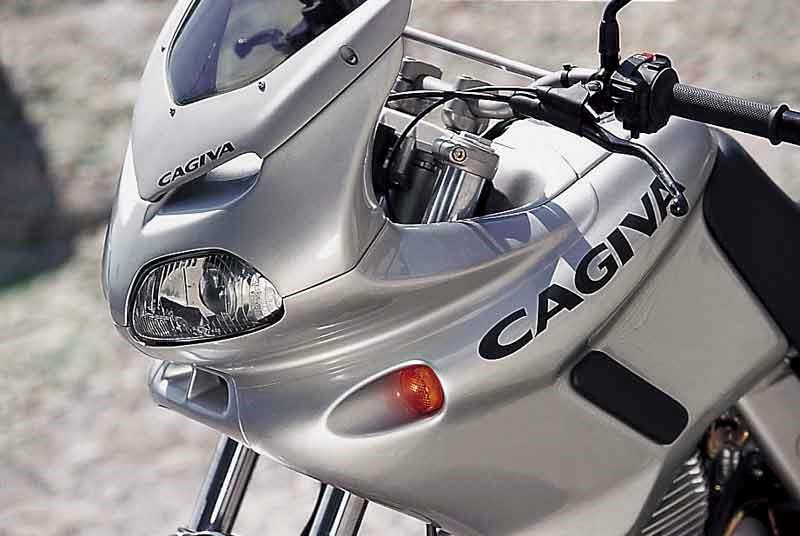 Buying one used is a real gamble, purely on Cagiva spares availablity if nothing else. Yes, Cagiva Canyons do go cheap secondhand. But there's a whole stack of reasons why and they're mostly bad news. 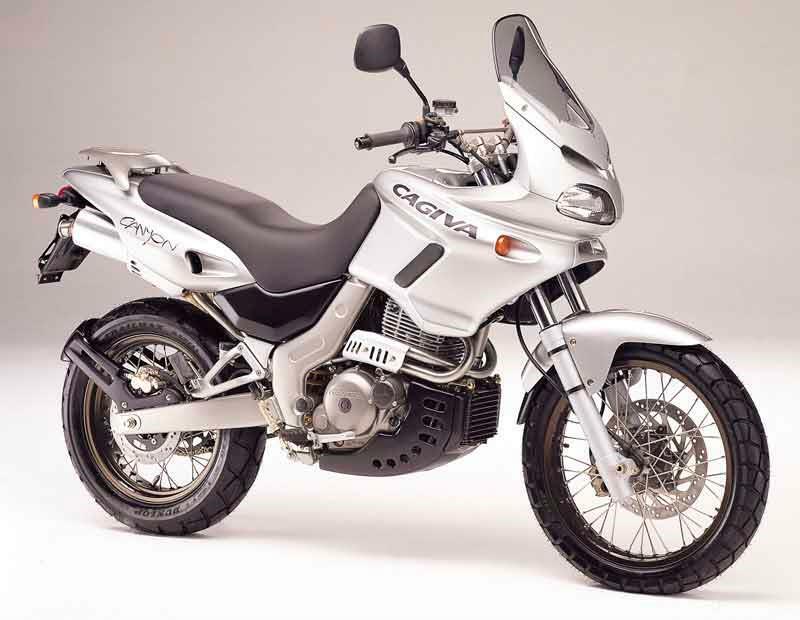 The Canyon's used buy competition in the shape of the Aprilia Pegaso 600/650, CCM R30, Suzuki Freewind 650, BMW F650 etc, all make the Cagiva look like a poor second choice. Which it is. 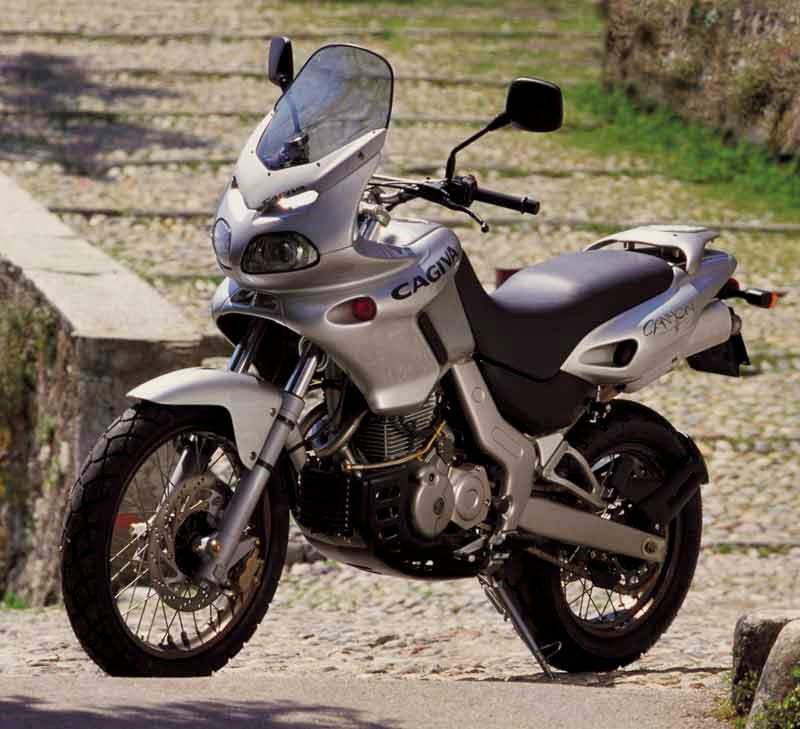 Find a Cagiva Canyon 500 for sale. 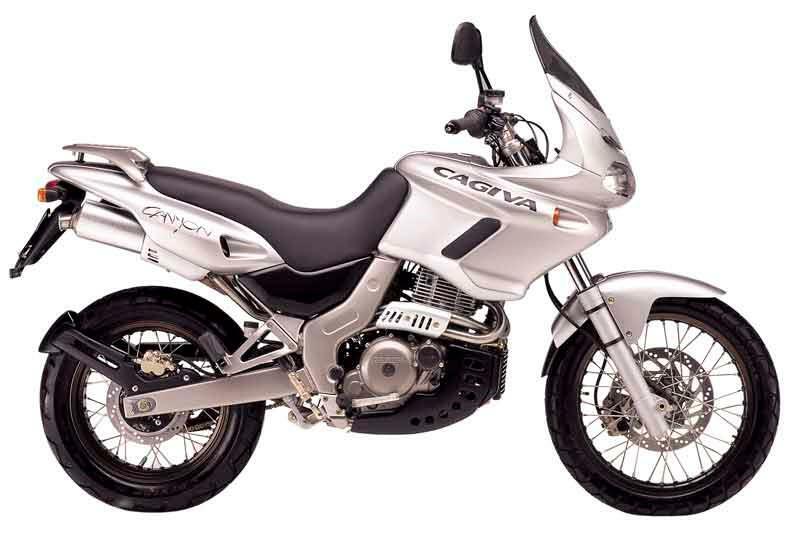 Actually, the Cagiva Canyon 500 looks really good. 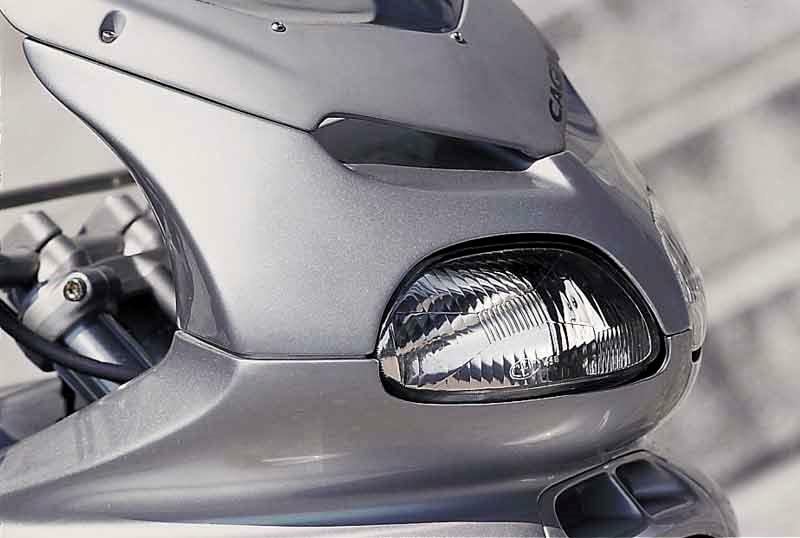 The nose fairing has an insect-like aggression about its bug-eyed stare, whilst the wide saddle, handy carrier and 20 litre fuel capacity help make it a viable commuter machine. On paper it's got all it needs - in reality, few riders fell for its quirky charms. 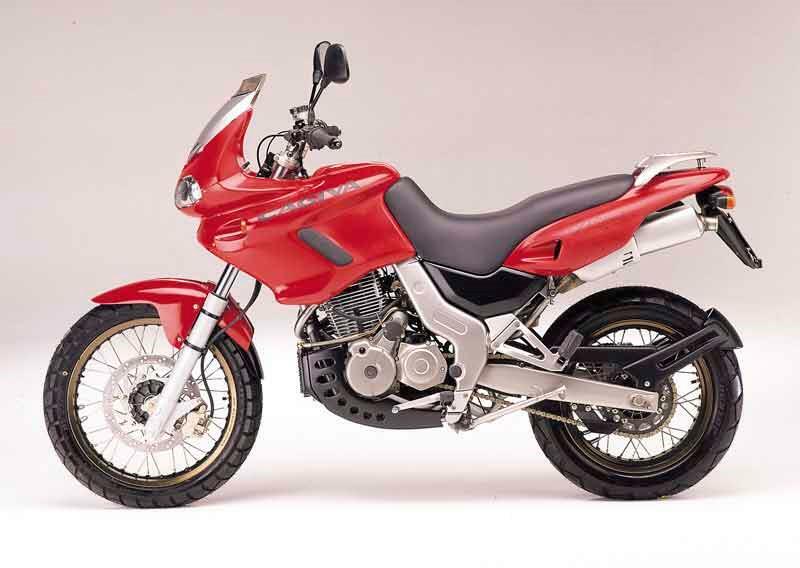 1996: Cagiva Canyon 600 launched in UK. 1998: Cagiva Canyon 500 replaces the 600. 8 owners have reviewed their CAGIVA CANYON 500 (1996-2002) and rated it in a number of areas. Read what they have to say and what they like and dislike about the bike below. There is Italian build quality, but it has proven to be reliable. I never got stranded with this bike unlike other bikes I have owned. Very comfortable on bad roads and over speedbumps. The front fork is very very good and eats everything you can throw at it. The rest of the bike just follows. The pillion has a better seat than the rider. 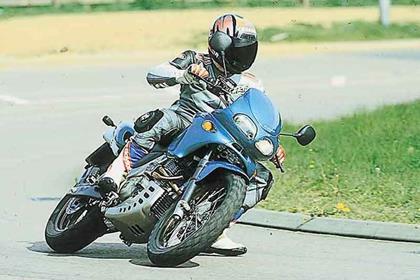 The bike is not made for traveling fast on motorways, but it is doable at a more modest pace. The brakes are sufficient. What MCN writes about the engine is true. 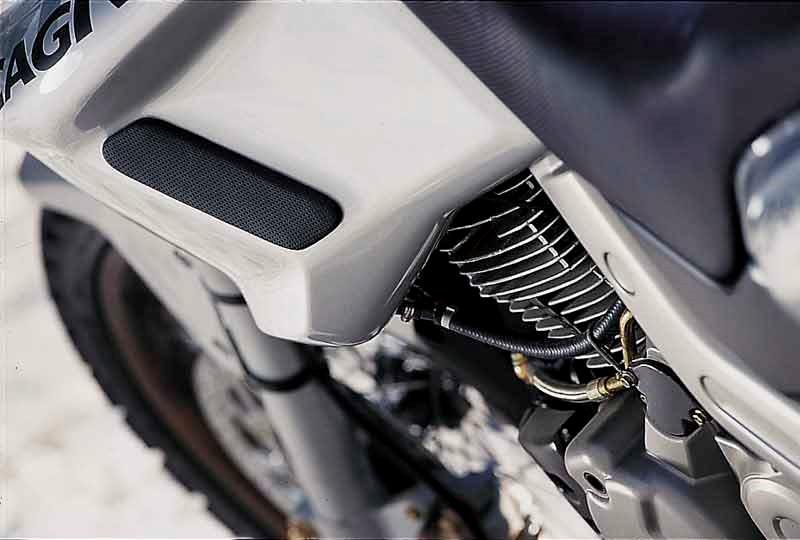 This bike deserves a better engine, look for the Grand Canyon. But this little Canyon has one trick up his sleeve engine wise MCN didn’t mention. Off road, in the mud or on a steep dirt road this engine has some kind of magical tractor mode which gets me out of trouble every time. Build quality? Some parts are better than others, but it's been more reliable than my BMW RT. When you fall while off-roading some parts bend but they don’t break. So you just bend them back into their original position. Yearly maintenance is minimal and easy to do yourself with the free online manual. Just change the fluids, plug and filters. There is a frame for mounting a topbox as standard. Additional equipment I have added includes: a topbox, a higher windscreen, heated grips, barkbusters and a navigation mount (RAM). I also use Conti Escape tyres. I bought it very cheap 10 years ago as a winter bike and it was already in a very rough condition, but now it looks even worse. Still, I have never regretted it. Just bought an old 2000 reg 500, I havent rdden for a long time, Ive had it a couple of months now, and so far, its behaved beautifully, I do about 70 miles a day too and from work, along winding country roads, and its propper fun, I tried it the shorter way back on the motorway, and the total lack of winsheild, made me want to never go on a motorway again. Anything after 60 mile an hour and you need nerves of steel, and fingers to match, clinging on. However, as i said along back country roads, uneven surfaces, its alot of fun, with a big throaty tone from the twin exhuasts I have a smile on my face most days. I have read that they have a real problem with the sprag clutch been a real weak spot, so I have checked the net in search of them for a back up replacement, and I would probably hvae more chance in finding the preverbial rocking horse poop, so fingers crossed, it wil hold together.